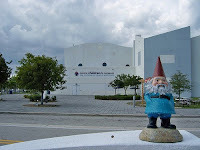 The Miami Children’s Museum is a non-profit educational institution in the city of Miami. It was found in 1983. Visitors of all ages are brought to the museum with different areas with activities for everyone. The 5,250 m2 facility includes 12 galleries, classrooms, parent/teacher resource center, Kid Smart educational gift shop, 200-seat auditorium. The museum offers hundreds of bilingual, interactive exhibits; programs and classes and learning materials related to arts, culture, community and communication.